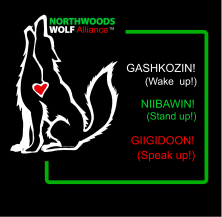 The Northwoods Wolf Alliance is a grassroots coalition of Anishinaabeg people and their allies working to protect ma'iingan (wolf), particularly in Anishinaabe Akiing (Minnesota, Wisconsin and Michigan). Anishinaabeg supporters include the members from the tribal nations of Grand Portage, White Earth, Sandy Lake, Bois Forte, Fond du Lac, Red Lake, Leech Lake, and Mille Lacs. The Northwoods Wolf Alliance has been formed for the purpose of building a coalition of individuals and organizations that oppose hunting and trapping of wolves, particularly in the Northwoods of the Great Lakes states of Minnesota, Wisconsin, and Michigan. Our very specific purpose in the short run is to prevent the hunting and trapping of wolves in Minnesota. Our long range goal is public education and ongoing protection of wolves throughout Minnesota, Wisconsin and Michigan. As an organization we are opposed to the sport hunt on wolves. As to other forms of hunting, this organization does not take a position, as this would be far outside our scope and intent. This organization has a deliberate emphasis on the environmental and related ethics of the Anishinaabeg, the original inhabitants of the area with which we are most immediately concerned. Anishinaabeg supporters include members of the tribal nations of Bois Forte, Fond du Lac, Grand Portage, Leech Lake, Mille Lacs, Red Lake, Sandy Lake and White Earth.